Creating a low carbon economy needs ‘a vision of God’s kingdom on earth’. 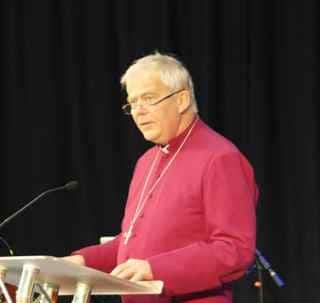 That was the message Bishop of Salisbury Rt Rev Nicholas Holtam gave to nearly 1,000 people at an ecumenical service during the Speak Up For The Love Of climate lobby in Westminster this week (17th June). Welcoming the Pope’s encyclical on caring for creation, Bishop Nicholas (pictured right) declared it is our ‘Christian concern’ to look after the planet. He noted there is an ‘ecumenical consensus’ for the environment.